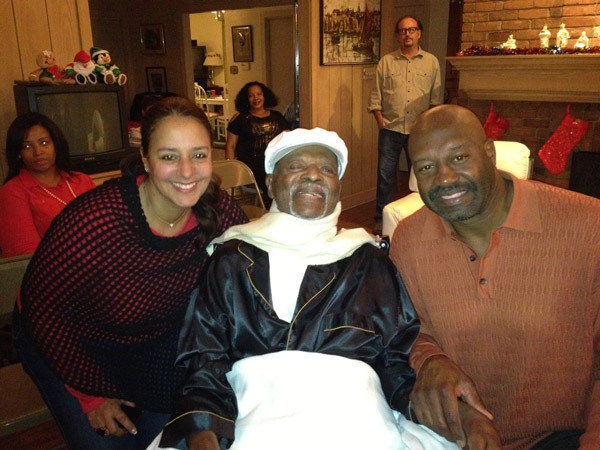 Big Prez (Clark’s nickname for God) has blessed us all to get ready for 2013! Man, I’m wishing everybody a Happy New Year! I’m praying that your dreams will come true, and things will be better than ever for all of us. Here at home, I am definitely going to celebrate. But first, I’m thanking Big Prez and all of you for helping me to stay above the grass. Absolutely! Couldn’t have made it by myself. God bless you all for that! A strange thing happened tonight. I told Marilyn (Turner. One of Clark’s health aides.) to hurry and get Gwen. When Gwen came to my bed, she asked me what was happening. I told her that I had to rush and get dressed for a concert, and I was worried because I didn’t know who was going to play with me. She told me later that since I hadn’t even tried to play in months, she decided to see if I would. So, when she saw how frantic I was, she said, “Well, let’s get your horn, and you warm it up while I get your clothes together.” Quincy (Cavers. One of Clark’s students.) came in and checked out the scene. Gwen told him to run and get my horn. When I blew a note, I snapped out of what had, apparently, been a dream. It was all a dream. The concert and everything. And the sound that came out of my horn brought me back to reality fast. It made me realize what I already knew: that you can’t just pick up your horn after a long time of not playing, and do what you used to do. But, man, it was a beautiful feeling to know that I was strong enough to hold my horn and blow that note! I’d been thinking that I was too weak. Gwen took the photo below while all of that was going on. Funny how dreams can seem so real. For a moment, I really thought I had a concert to play. It’s good to dream, because it can lead to reality. Now, I’m nowhere near being able to play like I used to do. But who knows? Maybe with some practice… Gotta keep a positive attitude. No matter what! Gwen asked me what my New Year’s resolutions are, and I told her that my only resolution is to “Keep Steppin’.” Full speed ahead! But, she kept at it, so I thought about a list of resolutions for the first time in a l-o-n-g time. Lately, I’ve had lots of time to think. Back when I was on the circuit, I was busy playing and teaching and traveling. Now, I’ve got more time to reflect. So, I came up with a few things. 1. I want to continue to do my part in mentoring young jazz musicians. They all enjoy learning about my “doodle-tongue” system, which helps them to articulate their fast passages better and more distinctly. We get a big kick out of it. That, and teaching them about the interpretation of the jazz language. I’d like to make a YouTube video about those lessons one day. One of the young trumpeters is planning to come back for more lessons soon. He’s seventeen years old, and his name is Ben Seacrist. He’s got a very promising career. And he’s been noticed by a few people in the business for whom I have great respect like Esperanza Spalding and Michael Miller. I’ve enjoyed spending time with Ben, talking about the things that he has tried and mastered. To see a video of Ben’s recent audition for the Grammy Band, click here. 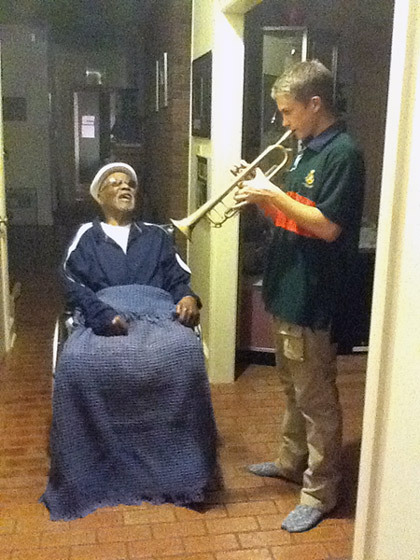 Here’s Ben Seacrist sharing a trumpet lesson with me. 2. Gwen wants me to work on eliminating cuss words from my vocabulary. I told her that I would try. It’s just the normal way that I’ve talked all of my life, and old habits are hard to break. She told me about a comedian named Steve Harvey, and all about how he is trying to cut out the cussing, too. I’m really going to give it a whirl, because now I realize that I don’t need to keep it up. It’s not a good influence on the younger cats. 3. I want to work on getting out of bed more. Right now, I’m up and in my wheelchair around 1 – 2 hours a day at the most. I know that I need to do better. I’m getting there, because I’m always doing my upper body workouts, and I’m getting stronger. 4. I want to finish my autobiography audiobook, and the CD with Q (Quincy Jones) and Snoop (Lion). Then do some jazz history CDs. If you’ve got a question that you want me to answer, or some suggestions for the jazz history CDs, just write a reply below or in my Guestbook. Your ideas would be beautiful, and they would mean a lot to me. I’m hoping to get back into the position of generating enough income to pay my own way again. Man, talking about being thankful when that happens! Then, I’ll be able to help others, like I used to do. And I can get back to supporting the Jazz Foundation of America, so they can help more jazz musicians in need. 5. I don’t know what #5 is yet. But I’ll think of something. Meanwhile, enjoy the New Year’s celebrations. And if you’re so inclined, I hope that you’ll check out the broadcast of my quintet when we played at Joe Segal’s Jazz Showcase in Chicago back in ’89. This was a New Year’s Eve gig that we did live on WBGO and NPR, and it was unforgettable. Absolutely. My dear friend, Red Holloway was featured, and you know what Red can do on his sax. Man! I really dug that set, and I hope you will, too. Willie “The Picker” Pickens was tearing those piano keys up! Larry Gray was definitely playing that bass, and Charles Braughan kept the drum beats swinging. Man! They were all playing their a.., oh, yeah, I’m trying to cut the cussing out. So, I’ll say that it was a great, great set. On wbgo.org, you can listen in at 1:30 a.m. (Eastern Time) on this New Year’s Eve, or 4:30 p.m. (Eastern Time) on New Year’s Day 2013. Remember that I love you all! When I was a young boy, I loved Christmas. Still do. You know why? Because it’s the season with a huge spotlight on “hope.” My birthday signifies a very special day of hope for me, but Christmas represents hope for millions of folks all over the world. I enjoyed my 92nd birthday recently, and I got some hip “goodies”. A few of my students surprised me and came to my party. They played some swinging music for me. Justin Kauflin on piano, Cameron MacManus on trombone, Quincy Cavers on sax, and Alan Hicks on drums. I was very happy that some of my tunes were included in their repertoire. You know how proud I am of my students. They played beautifully. They’re all professionals, now, and they can p-l-a-y! You’d better believe it! After that great music, I blew out my candles. 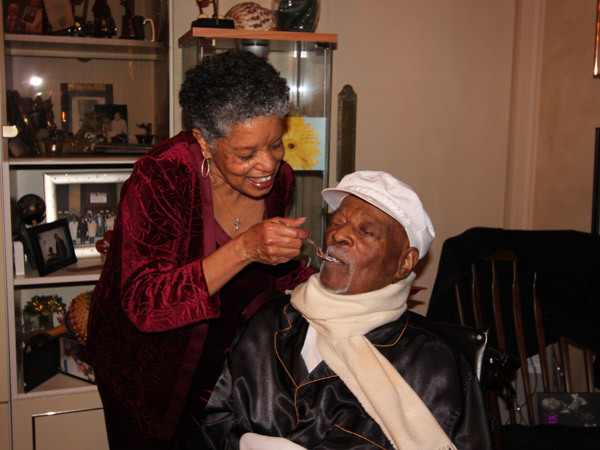 I’m glad that I didn’t have to blow out 92 candles! Here’s Gwen giving me a piece of my tasty birthday cake. My party was very cool. And my neighbors, Monte Coleman and his family, surprised me and came over. He’s the SWAC (Southwestern Athletic Conference) Coach of the Year, you know. Played pro ball with the Redskins. So, it was beautiful that he took time out of his hectic schedule, just to come and hang out with me and the cats. Man, I really enjoyed it! 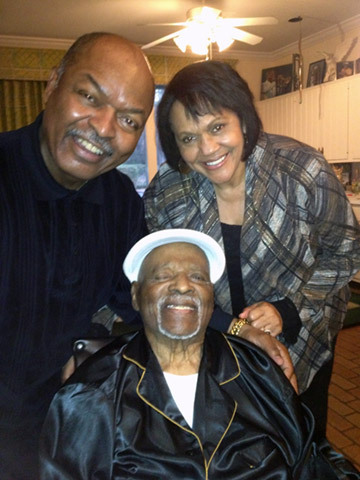 That’s Monte Coleman, his wife Yvette, and me. Speaking of Christmas, back in my childhood, I recall that my dad didn’t have extra bread to buy gifts because it was all he could do to raise ten of us children, with him being a widower. So, I couldn’t wait for Christmas to come, when we could get some “goodies” from the Forrestel family. They’d give big boxes of Christmas gifts to kids like us. My brothers and I pulled our makeshift sled for what seemed like miles and miles to the Forrestel’s house, and we had a ball. We didn’t say, “No, it’s too cold to go way over there. And when we get there, we’ll have to stand in the snow until our name is called.” We didn’t complain at all. It was fun, because we had high hopes. Now, at this time in my life, I realize that those gift boxes were much more than dolls for my sisters, clothes for me and my brothers. More than the really cool Tom Mix cowboy gloves that I got one year – replicas that Tom wore in his popular black-and-white movies. Those boxes were actually gifts of hope, because they represented something for all of us to look forward to. Something to inspire us to keep on keepin’ on. The love and the gifts I’ve received this year have kept my hopes alive. And I want to thank you, again, for all of those beautiful things. To my friends who played for me, Lynne Mueller and other friends who helped to organize that fundraiser last April; man, I’m eternally grateful. 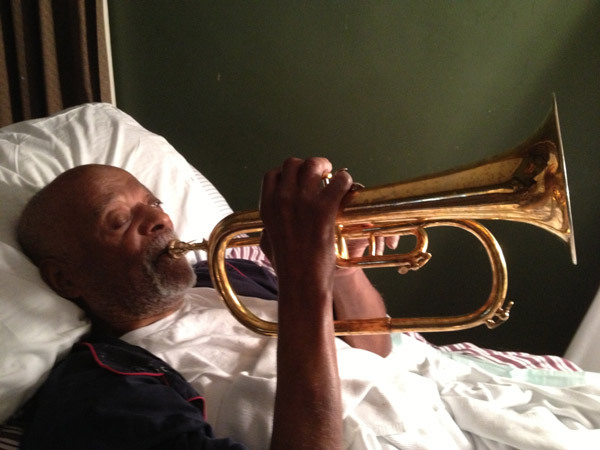 The Jazz Foundation of America (JFA) and other friends and fans have given donations that helped to pay for my health aides round-the-clock. I can’t thank you all enough. All of your kindness. Man! I appreciate it more than any words I can think of. 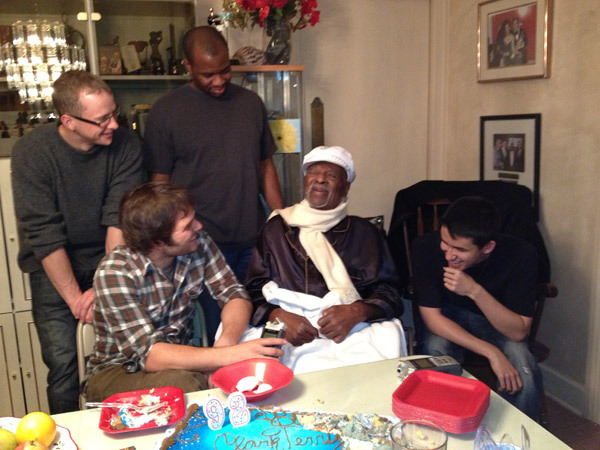 JFA has been helping jazz musicians for two decades! I call their leader, Wendy Oxenhorn, “An Angel on Earth,” because she oversees their business of helping our cats who are in need. Musicians like Freddie Hubbard, Cecil Payne, and hundreds more. Cats who are sick and can’t work. Having hard times. Period. I’m talking about help with medical and dental care, rent money, food, basic needs. Man! JFA helps to get replacement instruments for our musicians who lose their axes in storms. They helped Fats Domino to get a new piano when Katrina destroyed his. They’re really busy now, helping our jazz musicians who suffered losses from hurricane Sandy, and other cats who are down on their luck. Talking about spreading hope, that’s what they do on a regular basis. So, during this holiday season, I’m wishing you all a very Merry Christmas full of hope. God bless you all, and I love you! My 92nd birthday is on the 14th of December! You’d better believe that I’m thanking Big Prez (Clark’s nickname for God) for that blessing, and I’m praying to enjoy all of the “goodies” that are in store for me. Talking about being grateful. Man. I appreciate all the love from everybody who inspired me to “Keep On Keepin’ On!” And you know what? When you get to be an old fart like me, that’s the most important thing. Love. Pure and simple. That’s what keeps me going. To me, there are lots of different types of love. Big Prez is love. Jazz is love. Phone calls, family, cards, letters. My students and friends and fans. The list is long. And it’s something that I definitely don’t take for granted. The surprises that are in the works for me, that’s love. Now, I don’t know which ones, but a “little birdie” told me that some of my students are coming here to play for me on my birthday. I can’t wait! When I hear how they have progressed, it just fills me to the brim. Totally. This is a picture of me hanging out with the cats. That’s Ethan (Heyenga) on sax, and Josh (Shpak) on trumpet. They’re some very talented young musicians who flew down from Berklee to study with me. And on piano, that’s my good friend, Alan (Matheson). A great musician. Plays a mean cornet, too! He came down from Canada to shoot the breeze with us. They jammed up a storm! Teaching young cats is the way to go. When I think about some of my good friends – Billy Taylor, James Moody, Jimmy Heath and Frank Wess – and other cats like me who were on the jazz education scene from waaaay back, and then I hear some of these young lions out here perpetuating our music, it’s a good feeling. A really good feeling. Please click here for more on Dave. So, as far as I’m concerned, Dave is right here with me, celebrating my birthday and his, along with a whole slew of our friends who are up there with Big Prez. And to all of my beautiful friends here who sent me cards, folks who called me and wrote letters, I want to thank you. All of your prayers, I can’t tell you how much it all means. 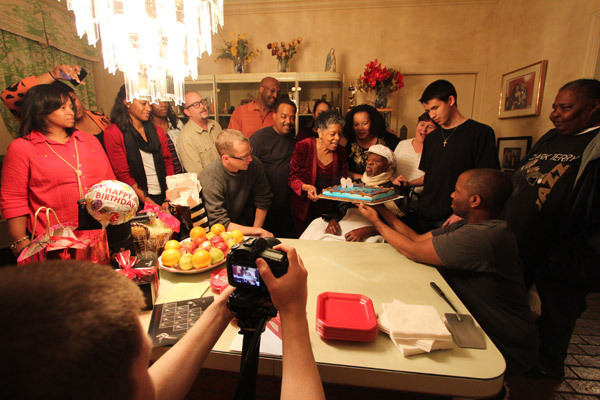 When my good friend Mickarl Thomas showed up here from Flint for a surprise birthday visit, man, I loved it! He brought his wife, Ann, with him. Beautiful people. Now, he’s a preacher, but when I tell you that he can tell some great jokes, you’d better believe it! He had me laughing hard. I love a good joke. He and his wife love to help the young folks at their church. You know, it doesn’t matter what business our young people want to get into, they all need guidance. My neighbor, Monte (Coleman), was just named “Coach of the Year,” and his football team just won the SWAC (Southwestern Athletic Conference) Championship! He’s working with those Golden Lions at UAPB (University of Arkansas at Pine Bluff). And his quarterback, Ben Anderson, surprised me with a birthday visit. This young man threw a 95-yard touchdown pass! He’s a real nice kid with a bright future ahead. He said that he plays the sax, and his father is a big jazz fan. You can read more about Ben and the championship game here. I wonder what other birthday surprises are down the pike? I’ve been thinking about my birthday cake, and what it’s gonna look like. Now, I know that I’m diabetic, but I told Gwen that I just want to taste a small piece. If they put 92 candles on my cake, I guess I’ll have to do some circular-breathing to blow them out! I’ll be thinking about you, sending my love to each and every one of you. And for my wish, I’m hoping that you’ll keep helping our young folks to make their dreams come true! My Autobiography Won Two Awards! Man, I tell you, Big Prez (Clark’s nickname for God) keeps sending reasons for me to stay positive. It’s good to have more reasons. At 91 years old, I need all of the reasons that I can get. And I’m very grateful, in spite of losing my front tooth. I just want to thank all of the kind folks who voted for me. Seriously. I’m glad that they liked my work. It took a long, long time to get all of the facts down. Over twenty years. I had a lot of fun reminiscing about those memories. Gwen and a whole bunch of folks helped me to finish my book, and I was blessed to have a great publisher (University of California Press). When I got the letter from Paul Williams (President and Chairman of the Board at ASCAP), letting me know that my book had won such a prestigious award, it really made me happy. You know, I had to thank Big Prez right then! I wish that I could have been at the ASCAP award ceremony in New York a few days ago. But, it just wasn’t in the cards. I would have thanked Paul and everybody there for doing so many beautiful things for our music. This is from the ASCAP award ceremony a few days ago. On top of the ASCAP honor, I found out that I had won an award from ARSC. Now, that’s when I got quiet. I just had to think about it, you know, and thank Big Prez for another big blessing. It was a good feeling to know that the nice cats at ARSC thought that my book was worthy of their award. I was thinking, Out of all of the books out there, they chose mine. That was really beautiful. And as soon as I find out about the ARSC award ceremony, I’ll hip you to it. All of these big blessings keep me from feeling like an old fart. Keep me going. Keep me hanging in, over and around. As long as I’m not hanging under, I’m okay. 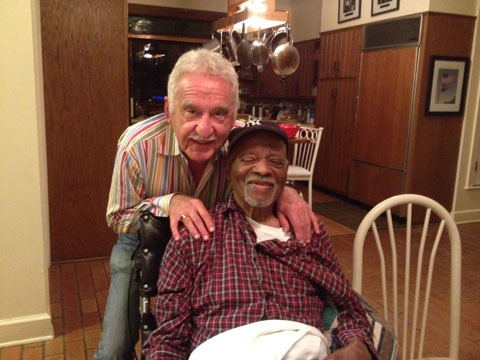 Talking about blessings, my old buddy, Doc (Severisen), came to see me. Man! He said that he loved my book, too, especially what I wrote about him. I tell you, things like that really mean a lot. It was just beautiful hanging out with Doc, shooting the breeze about the years we played in Charlie Barnet’s band and The Tonight Show Band, listening to some music that we recorded together here and there. Doc and me hanging out a few weeks ago. Some of my students are coming to celebrate my 92nd birthday on December 14th. You know how I love my students! Man, I’m so proud of them. I’m thanking Big Prez for them, and for giving me another year. And I want to thank you all for being in my corner. I appreciate each and every one of you for all of the prayers, and for pulling for me. 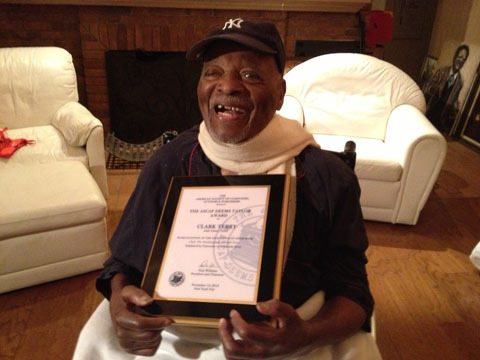 The Board of Directors of the Louis Armstrong Educational Foundation voted recently for Clark to be the recipient of this year’s prestigious “Satchmo Award,” which includes a $5,000 check. When I shared this exciting news with Clark, he was ecstatic. He had tears in his eyes, and I did, too. 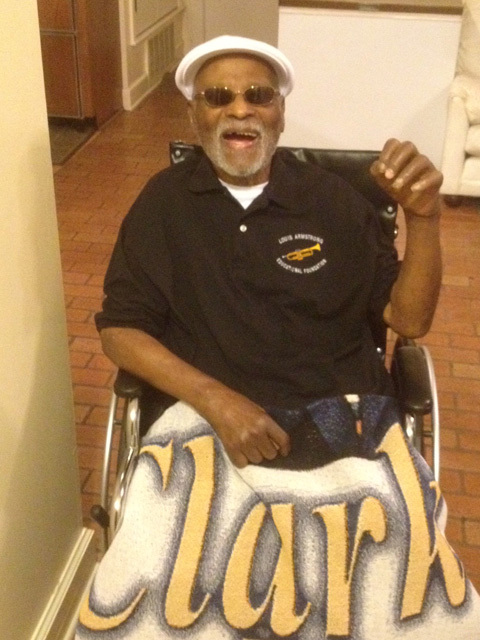 Clark wearing his foundation shirt, sharing his joy with a wave to everyone. As we sat together, discussing the award, Clark said, “I know Pheobe (Jacobs) is up there smiling down, too. She was a real mover and shaker. Hard worker in our corner for jazz. Helped Pops a whole lot. I miss her.” Phoebe served as Executive Vice President of the foundation for many years. 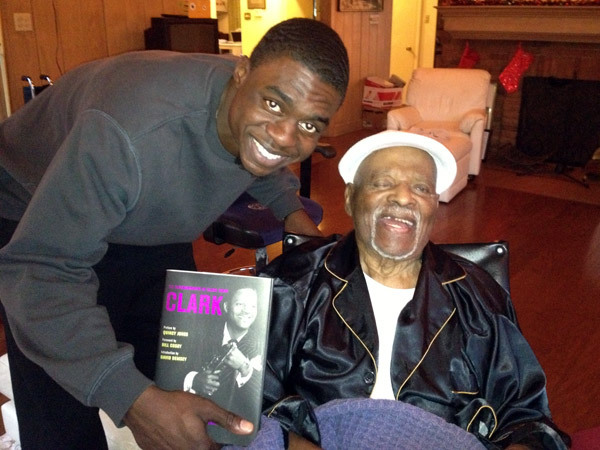 A ceremony is being planned by the foundation to officially present the Satchmo Award to Clark. 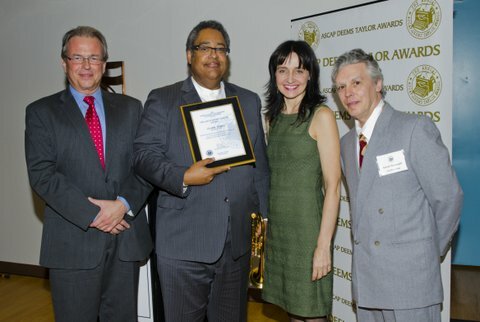 Previous recipients were Herb Alpert in 2010, and Barry Harris in 2011. For more information about The Louis Armstrong Educational Foundation, Inc., and other Louis Armstrong organizations, please click here: http://www.louisarmstrongfoundation.org/. Clark is getting stronger since his surgery in July of this year, under the care of Dr. Jonathan Laryea at the University of Arkansas Medical Sciences (UAMS) hospital in Little Rock. There have been no new health challenges. Thank God! He’s doing his daily exercises and his spirit remains high. Currently, he’s able to sit in his wheelchair for a few hours each day. He’s working hard to increase his time out of bed, getting closer to his goal of teaching via Skype. 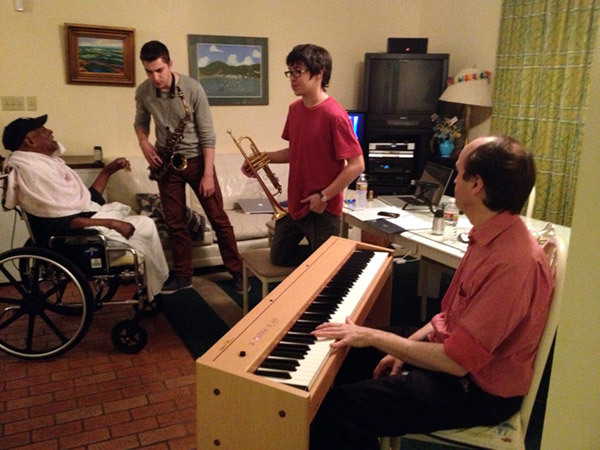 His students continue to fly in for lessons, either from his bedside or his wheelchair. We appreciate your prayers, visits, cards, letters, website posts, calls and donations so much. Everyone here is working hard to provide Clark with the 24-hour care that he needs. His appetite is strong, and he’s determined to “keep on keepin’ on.” Please keep him in your prayers.